When I've asked technical professionals about their impressions of salespeople, I've usually heard that salespeople tend to talk too much and listen too little. Yet when I've accompanied many of these same technical professionals on sales calls, guess what I've often witnessed: Too much talking and too little listening. I suppose we're accustomed to copying what salespeople do (and I'm not immune to this problem) because that's the example we've inherently learned from—even if we dislike it. But it goes deeper; most of us suffer from a strong self-orientation that naturally manifests itself in doing more talking than listening. Selling only makes matters worse because we assume that talking is the best way to persuade. Yet one of the most powerful sales techniques is simply to listen more. When RainToday surveyed professional service buyers (including those who purchase A/E services), the number one complaint they made about sellers was their failure to listen enough. Of course, effective listening involves asking the right questions the right way, an issue I've addressed in a couple of previous posts (Part 1, Part 2). Don't overlook the value of being silent on occasion either. Years ago I learned one of the most effective techniques ever in encouraging buyers or clients (or anyone else) to share more information with you. It's called Golden Silence. It leverages our natural discomfort with prolonged silence in conversation with people we don't know intimately. How prolonged? It can be less than 5 seconds. Research shows that the average salesperson, after asking a question, will only wait 2-3 seconds before rephrasing the question, answering it himself, or moving on to another topic. That may sound extreme, but I've observed this myself in numerous sales calls. Apparently, only 2-3 seconds of silence is enough to subconsciously prompt salespeople to fill the gap. You can use that tendency to your advantage. Ask a question, then pause 3-4 seconds before saying anything more. Some call that Golden Silence I. 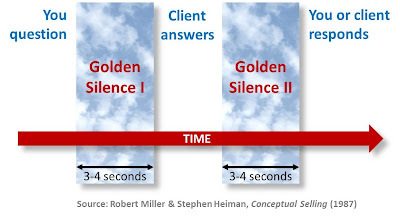 Then after the client responds to your question, pause another 3-4 seconds—Golden Silence II. This is where you'll really see the power of silence. Waiting that additional second or two can have a remarkable impact on your sales conversations. Without realizing it, the client often senses a need to extend his or her answer because of your delay in responding. Therefore, the space just beyond Golden Silence II is where I often glean my best insights into what the client is really thinking. It sounds gimmicky, I know, but it works. Give it a try, perhaps in conversations with others first. Let me suggest a couple of limitations, however: (1) Don't overuse it, because it can make the client consciously uneasy, even if he or she doesn't really understand why, and (2) It won't work as well (or maybe at all) with people you know well because they will be more comfortable with the extended periods of silence. Of course, you probably don't need to resort to Golden Silence to get such a person to share openly with you. Practicing Golden Silence judiciously will help you with another important tactic in sales conversations—slowing things down. Many people, especially those uncomfortable with the sales role, have a tendency to rush the conversation. Perhaps they're trying to cover too much ground in one conversation (one reason it's crucial that you plan your sales calls). Often it's a result of trying to share too much information without giving enough attention to getting information. So if you're struggling with making the sales pitch, don't. Emphasize helping rather than selling. Try asking more great questions and sometimes—strategically—saying nothing at all.